Occupied Ramallah - 10 December 2015 –This year, Palestinians mark International Human Rights Day mourning over 118 Palestinians including 25 children who were killed by IOF in the past two months. Palestinians mark this day following two months of nonstop violence and widespread human rights violations by Israeli Occupation Forces against the Palestinian civilian population in response to a popular uprising in the occupied territory. Today, over 6,500 Palestinians remain imprisoned by Israeli occupation including at least 450 children, 587 Palestinians held under arbitrary administrative detention without charge or trial and five members of the Palestinian Legislative Council. In the past two months, Israeli Occupation Forces have escalated oppressive policies and practices against Palestinians in the occupied territory in a flagrant violation of fundamental human rights and freedoms. Since the beginning of October IOF has been conducting a mass arrests campaign in the occupied territory whereby over 2,256 Palestinians were arrested including at least 399 children as well as 247 Palestinians who were placed under administrative detention without charge or trial. Addameer continues to monitor the Israeli occupation’s daily policies of arbitrary arrest and detention of Palestinians, the widespread use of torture and ill-treatment as well as the extrajudicial executions of Palestinians by IOF forces. These policies are aimed at imposing collective punishment against Palestinians for their uprising against Israel’s oppression and outrages against their fundamental rights and inherent dignity which International Human Rights Law aims to preserve. 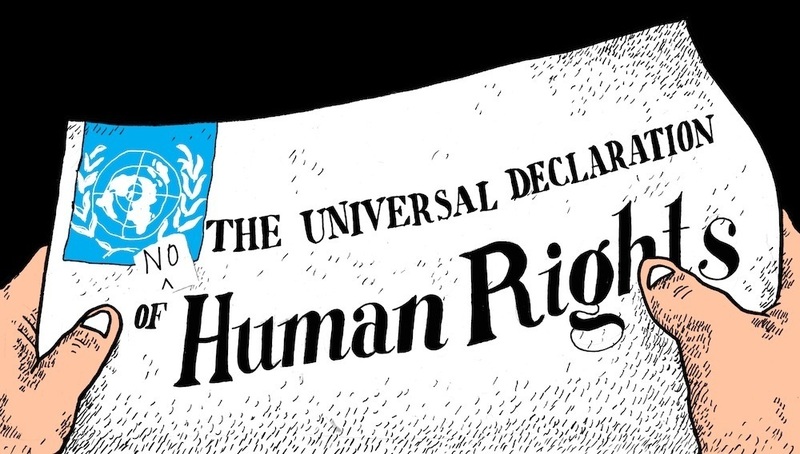 Under Article 3 and Article 9 of the Universal Declaration of Human Rights, all human beings have the right to liberty and the right not to be subjected to arbitrary arrest and detention. Palestinians, however, have suffered from a widespread policy of arrests and use of arbitrary detention by IOF for decades. Since 1967, an estimated 800,000 Palestinians have been arrested by Israeli occupation. Arrests have been used by the Israeli occupation as means of imposing control, collective punishment and suppressing any forms of resisting occupation and even as means to suppress civil and political life in the Palestinian society. Since 1967, an estimate of 50,000 Palestinians have been subjected to administrative detention without charge or trial based on secret undisclosed material not accessible to detainees and their lawyers. Israeli Occupation Forces regularly carries out mass arrest campaigns during times of escalation or in response to political developments in the occupied territory in a manner that renders the arrests arbitrary. The use of administrative detention against children, human rights activists and Palestinian political figures indicate the arbitrary nature of the use of administrative detention by Israeli occupation and its illegality under International Humanitarian Law. The United Nation’s Working Group on Arbitrary Detention has often underlined the arbitrary nature of depriving persons of their liberty and subjecting them to administrative detention solely based on undisclosed evidence which the detainee cannot challenge. The use of administrative detention and trials before partial/politically motivated Israeli military courts further infringes on the right to fair and public hearing by an independent and impartial tribunal. Since 1 October 2015, an average of 30 Palestinians were arrested every day; an estimate of over 2,256 Palestinians. Of those arrested, 247 Palestinians were placed under administrative detention without charge or trial and without being able to challenge their detention. Today, at least 587 Palestinians are held under arbitrary administrative detention including four children and two members of the Palestinian Legislative Council. Due to the high number of arrests, the Israeli Prison Service (IPS) opened new sections in prisons to accommodate this increasing number of detainees. Two tent sections have since been opened in Al-Naqab Prison, in addition to a new section in Gilboa Prison, Givon Section for children in Al-Ramleh Prison and a new section for female prisoners in Al-Damon Prison. Palestinians are constantly subjected to different forms of ill-treatment and torture during arrest, transfer, interrogation and imprisonment. In the past two months Addameer has documented an escalation of the use of violence and excessive force against Palestinians during arrest and detention. Several Palestinian youth were arrested after being shot by IOF forces in the aftermath of alleged stabbing attacks. Many of those who were arrested after being shot were subjected to field interrogations while bleedings, interrogations during treatment in hospitals while chained to bed as well as being subjected to harsh interrogations shortly after release from hospitals. Ibrahim Shwiki (22 years old) was arrested by IOF forces on 12 November and charged with inciting violence through Facebook. Several Palestinians have recently arrested under the claim of inciting violence and racism through social media. During detention, Ibrahim was brutally assaulted by prison guards and officers after they raided his cell during the night. He and the other detainees were forced to lie on the floor. Then one of the prison guards pointed at Ibrahim and immediately one of the guards assaulted him with a baton on his head before others proceeded to punch and kick him. Ibrahim was then taken to the waiting room. There he was handcuffed very tight that blood flow to his hands was restricted. Ibrahim shouted in pain for hours asking for the handcuffs to be loosened but his pleas were not answered. Ibrahim was then placed in solitary confinement as punishment for praying loudly in the cell and specifically for saying “Allahu Akbar” loudly during prayer. Ibrahim was also assaulted while in solitary confinement after requesting to call his family, knowing that the judge did allow him to make a phone call to his family. Although Ibrahim was suffering from pain due to the beating especially in his back, he was only taken to see the prison doctor a week after the assault. By then all marks on his body were no longer visible. Inhumane Detention Conditions are also very common and are often reported by Palestinians detained by Israeli occupation. Several Palestinians detained at Huwwara detention center complained to Addameer’s lawyers about poor detention conditions. Detainees reported that the food they are receiving is insufficient and not nutritious . The detainees have also complained that the cells are very dirty and unhygienic as well as being overcrowded; 6 detainees are held in a 4*3.5 meter cell. Furthermore detainees as Huwwara detention center reported they received dirty mattresses and were not given any clothes for days. Ill-treatment was also reported in Oz interrogation center. Originally a police station, detainees including children reported they were shackled and left on the floor outdoors in the cold or in caravans for several hours before being transferred to detention centers. Detainees have also reported ill-treatment and physical violence at the hand of interrogators. Under International Human Rights Law, children must be afforded special protection and their best interest should always be a primary consideration. The Convention on the Rights of the Child, which was ratified by Israel in 1991, prohibits the arbitrary detention of children and stipulates that the detention and imprisonment of children should only be used as a measure of last resort and for the shortest appropriate period of time. Palestinian children, however, are regularly subjected to arrests and detention by Israeli occupation. Children often undergo ill-treatment at the hands of IOF forces and are subject to a wide array of violations. Arrests usually take place in night raids and are often physically and verbally abused during arrest, transfer and detention. Almost one fifth of those arrested since 1 October were children, which resulted in tripling the number of Palestinian minors held in Israeli occupation prisons that spiked from 156 children by the end of September to at least 450 children. At least four children are currently held under administrative detention considered to be a “direct and immediate threat to the national security of Israel.” Israeli occupation also continues to target children with new harsh policies and laws including a new draft law which would allow custodian sentences for children as young as 12, amendments to the Israeli penal code which allow imposing 10-year prison sentences for throwing stones and instituting a minimum sentence of 3 years for stone throwing. Ali Alqam (12 years old) is currently the youngest Palestinian child detained by Israeli occupation. Ali was arrested on 8 November after allegedly attempting a stabbing attack in the Jerusalem light train. Ali was shot with live ammunition three times in his abdomen, pelvis and hand by an Israeli security guard. Ali was underwent several surgeries to treat the bullet wounds. On 22 November, Ali was transferred to a closed treatment facility pending trial. Ali’s cousin, Muawiya Alqam (14 years old) was arrested with Ali in the aftermath of the same incident and is currently detained in Givon Prison. Salam Quraan (16 years old) was arrested by IOF forces on 14 October on his way back from school in Ramallah. An Israeli soldier assaulted Salam from the back while he was walking home, then proceeded to beat him along with eight other soldiers. Salam was repeatedly beaten for approximately five minutes in the stomach and at least once in the testicles. Salam was then dragged from his feet causing several wounds on his body including his hands and head. Salam was then transferred to a nearby settlement where he was blindfolded and forced to wait in room for several hours. He was slapped several times while waiting and his photos were taken by the soldiers. Givon Prison was opened in October 2015 to accommodate the large number of children arrested by IOF forces. Currently there are 70-75 children detained in Givon. Children have complained to Addameer’s lawyer about ill-treatment as well as unhygienic conditions and dampness in the prison. Children have also complained that the food they are receiving is insufficient in portions and of poor quality. The children are isolated in Givon from adult Palestinian political prisoners who usually provide social support and help imprisoned Palestinian children communicate with the IPS and prison wardens. Several of the children informed Addameer’s lawyer Mona Naddaf during a visit on 3rd of December that they are suffering from nightmares, sleep disorder, loss of appetite, sadness and feeling isolated. The children also stated they were subjected to ill-treatment during interrogation including being denied using toilets, being deprived from food, being subjected to physical beating, threats and sleep deprivation. Some of the children, who were injured during arrest, have also complained they aren’t receiving medical treatment or are receiving it with significant delays. Working Group, opinions Nos. 5/2010 (Israel) and 26/2007 (Israel). As stated in the administrative detention orders issued against the children.